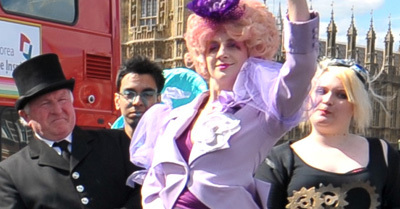 THE O2 ARENA HOSTS A FAN SCREENING OF THE 15 CERTIFICATE VERSION OF THE HUNGER GAMES AND LIVE REAPING ON TOP OF THE O2! The Hunger Games came out on DVD yesterday, in both its original 12A cut and a new 15-rated version (the 7 second difference concerns the ‘digital removal of blood splashes and sight of blood on wounds and weapons’). To celebrate, Lionsgate have set their promotional phasers to stupefy. 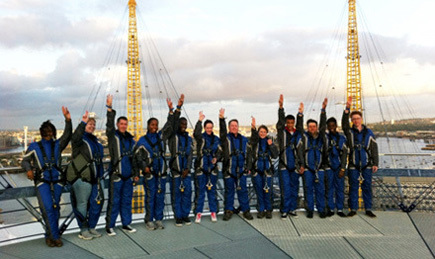 Last week, they got a bunch of kids to climb the O2 for a ‘live reaping’ (don’t ask) before treating them to a screening of the much-fêted ‘blood splash’ cut of the film. 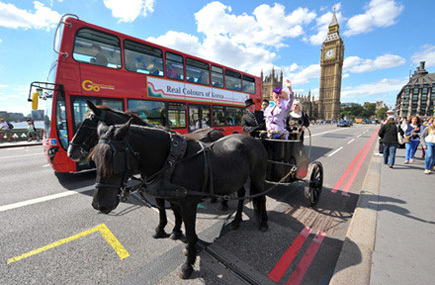 The chariot ride began at Battersea Park and continued through to Westminster and along the Embankment taking in key London landmarks. The nearest District Line stop to Battersea Park is Sloane Square, which is over a mile away. Still, if we’re calling that chariot ‘futuristic’ then I guess we can play a little fast and loose with the exact specifics of the London Underground map as well. At least no one looks like they’re about to die of embarrassment. The Hunger Games is out now in both theatrical and eXtReMe blood splash versions. It’s sort of alright, not great, if you know what I mean.